Most regulations specify that a backflow preventer test kit must be calibrated and certified once per year. 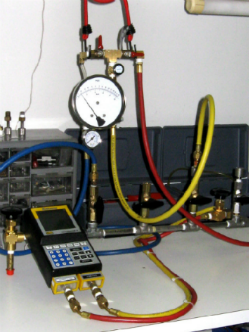 Buffalo Backflow can calibrate any manufacturer’s backflow test kit, whether it is a Watts, Apollo, Conbraco, Midwest, or any other kit, we can keep it in compliance for you. We will calibrate the kit, provide a calibration sticker on the face of the gauge with calibration date and due date, and a certification of test kit calibration traceable to NIST. Free Yearly Re-Calibration Recall Included! In addition to calibrating your Backflow Kit, we enter you into our re-calibration recall database. This program will send you an alert 60 days in advance of your calibration due date. This reminder gives you plenty of time to send your in for re-calibration and keeps the kit in compliance with State and local regulations.